Build and love your own piece of paradise in the comfort of your backyard with our exceptional range of Entertainment and Lifestyle products. 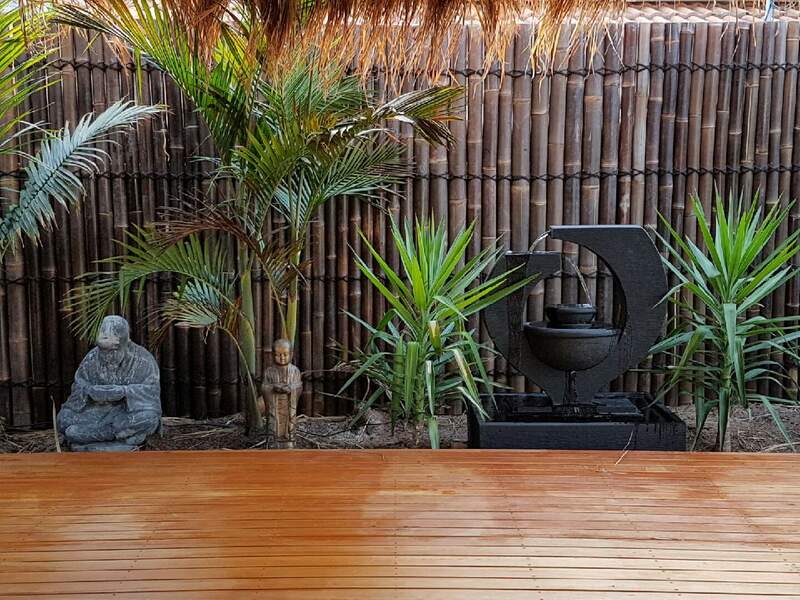 We’ve got stunning Bali Huts, Bamboo, Ornaments, Water Features and more to transform your place into a stylish and functional backyard. Within this range you’ll also find Aarons Pet Houses and Colorbond® Gazebos. Aarons Outdoor Living stores have a large display of all our products including our stylish Backyard Entertaining collection. View our Store Locations. Need some help turning your backyard into your your own piece of paradise? Aarons Landscaping team of experienced consultants are ready to help transform your area! View here. Create a tropical and tranquil oasis in your own backyard! We import the highest grade Alang Alang grass and use a solid timber frame to bring you the best Bali Hut on the market! 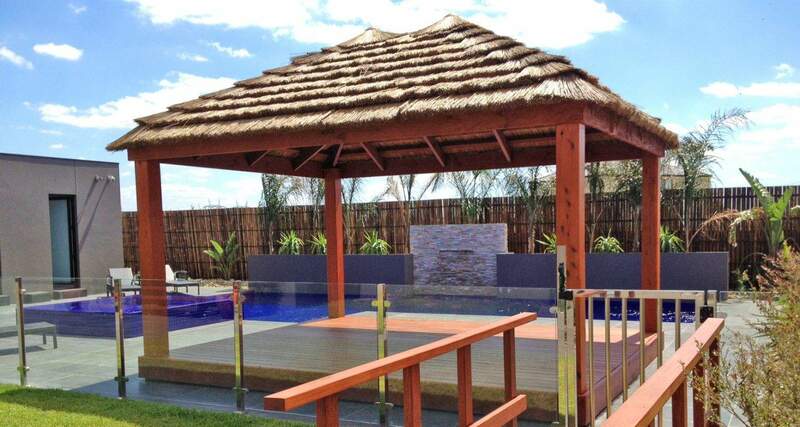 Your Bali Hut can be personalised with a range of options to suit any backyard, style or taste. Bali Huts are completely waterproof and will reduce heat by up to 10 degrees in Summer. Our 30 degree pitch roof frames ensures that water runs straight off the roof and away from your outdoor furniture. Aarons African Thatch; perfect for a formal African Cape Reed thatch, with an architectural look and feel. Instantly create an entertaining for any size family or gathering. Our African Thatches come in a range of sizes and are completely waterproof. 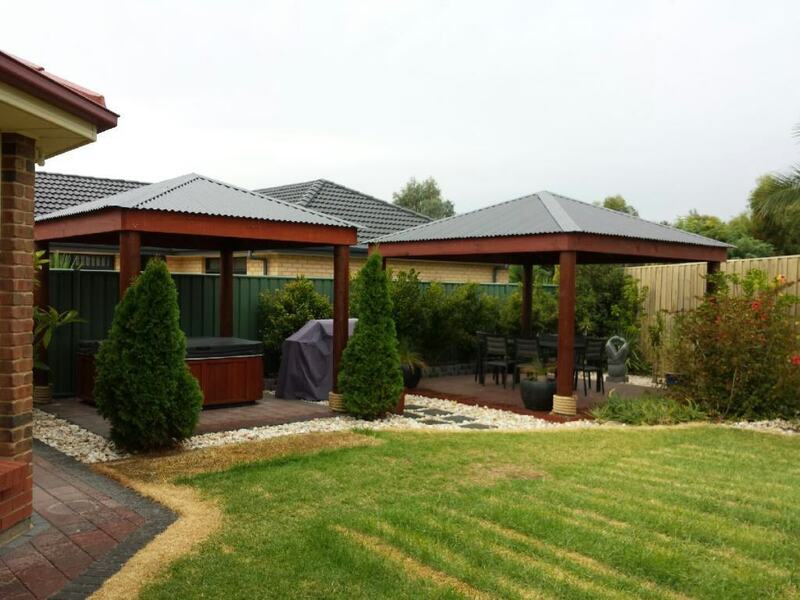 With a skillion, Colorbond roof, Aarons Pergolas provide an instant and modern entertaining area. Whether you install an Aarons Pergola to protect your spa, outdoor furniture or barbecue from the weather or you use it to entertain guests – it will be a complimentary addition to your outdoor space. Create a classic and stunning focal point in your garden. Aarons Gazebos are perfect for entertaining a small group of friends or a large family! 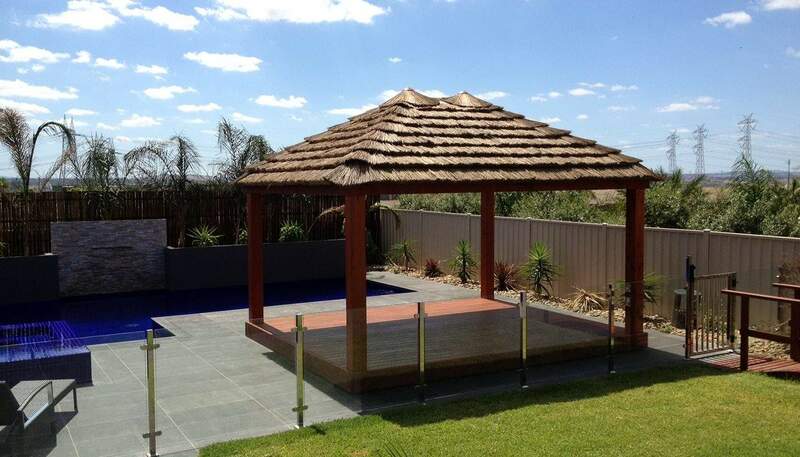 With a pitched gable colorbond roof, this is your classic gazebo style. 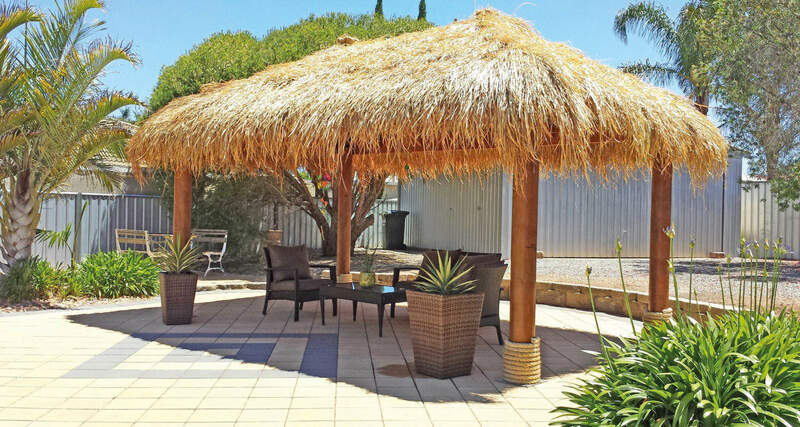 Aarons Gazebos are built to outlast the Australian climate. 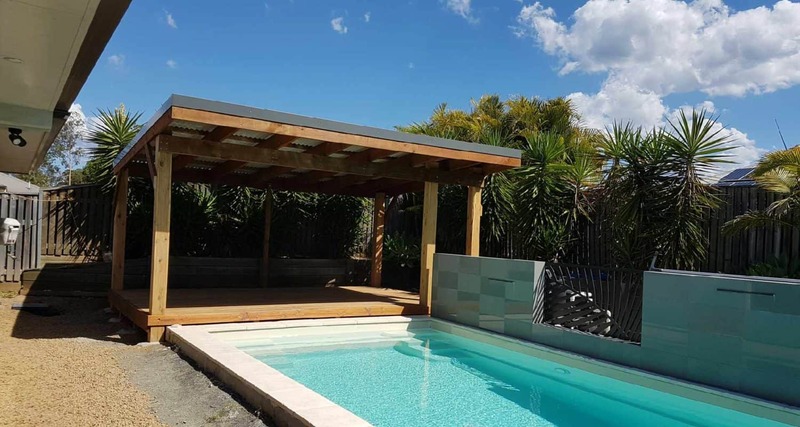 Our timber has been treated to protect against rot and termites and, as with all our products, we use only Colorbond® roofing to ensure longevity. Is your thatched roof weather damaged, tattered, leaking or in need of some TLC? Aarons Outdoor living can revitalize your hut and have it looking like new again. Aarons Outdoor Living can revitalise your hut and have it looking like new again. 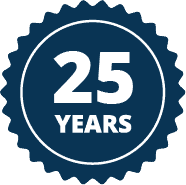 Aarons Outdoor Living have a team of specialist fully equipped to provide after sale service maintenance or a complete rethatching to your hut. Do you need a quote for an insurance claim? No worries! We are recognised by all insurance companies. Timber Decks can turn any space into a entertaining area for your guests. Aarons Decks are an easy way to create a modern space or multi-level landscaping that will increase the value of your home. 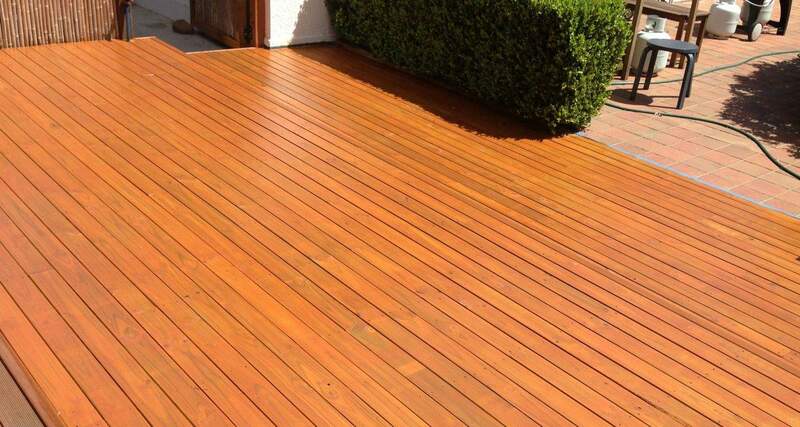 Timber Decks can be attached to your house or free standing and can be customised to suit your space. Not all homes are able to have a garage, but there are other options to having an off-road private space to park your car and it’s called a carport! 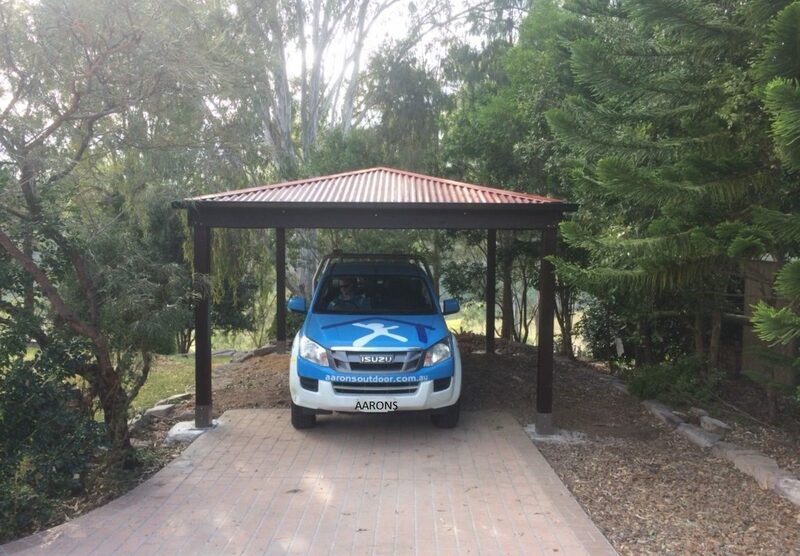 With a skillion, Colorbond® roof, Aarons Carports provide a great alternative for keeping your car, boat or caravan proteted from the weather. 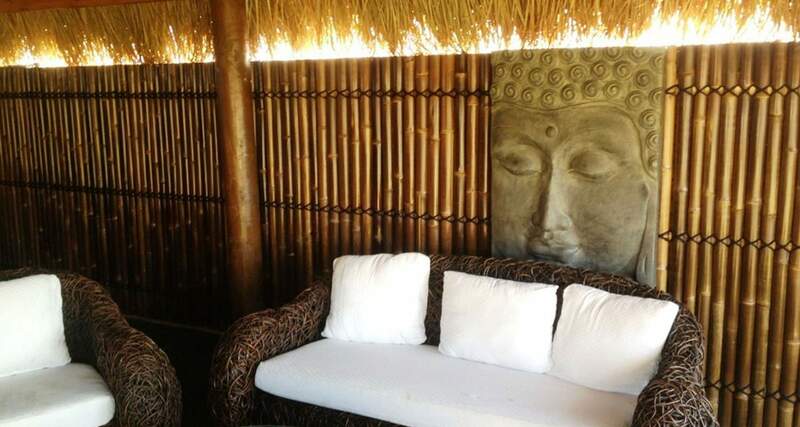 Aarons Bamboo Panels; instantly create the tropical paradise you’re looking. Great for privacy screening or decorative fencing. Bamboo Treatment Oil also available. 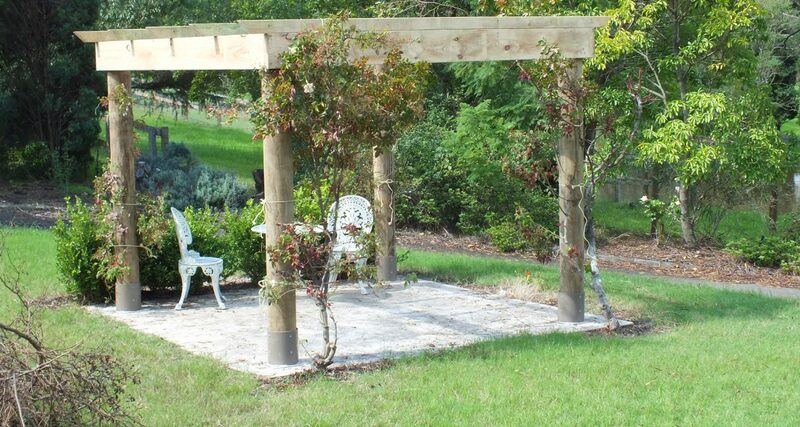 Aarons Garden Features add creative design to any backyard in a range of styles. Aarons Outdoor Living has an exclusive collection of handmade pots in a large variety of sizes and designs to complement any garden. Create a tropical and tranquil oasis in your own backyard! Aarons Pet Houses offer your beloved fury/feathered family members a home for life. We offer our Dog Kennels in 3 great sizes and also a versatile Chook House / Cat Enclosure / Bird Aviary.